BJ Betts recently sat down with Premium Pete for an interview on his The Premium Pete Show about being in the tattoo industry for over 20 years, designing for Nicki Minaj, getting tattooed by Sade, and more. 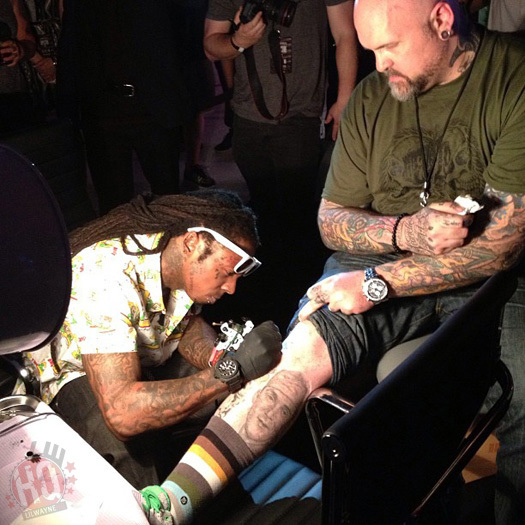 During their conversation, the tattoo artist and graphic designer also recalled the time that he asked Lil Wayne to tattoo his name on him at a SUPRA event back in 2013. Even though he told BJ Betts he had not done anything like this before, Wayne did proceed to ink his name on Betts‘ leg. You can listen to the full story from the 44:00 mark on the audio player after the jump below. Enjoy! 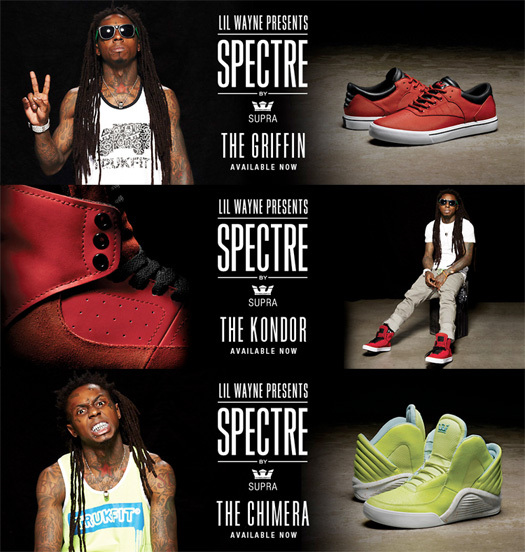 Lil Wayne’s “Griffin”, “Kondor” & “Chimera” SUPRA Sneakers All Available To Buy! All three shoes from Lil Wayne‘s SPRECTRE by SUPRA footwear line are now available for purchase! 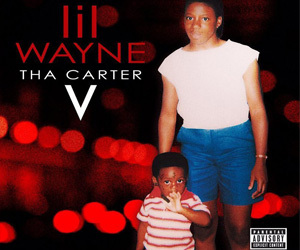 The titles of these sneakers, which Wayne picked because they are similar to his own style, are “Griffin”, “Kondor”, and “Chimera”. Weezy F Baby‘s “Griffin” shoes cost $75.00 and come in three colors: Black/Gold/White, Red/Black/White, and White/Grey/Blue-White. The “Kondor” shoes cost $100.00 and come in two colors: Red/Black/White and Black/White. And lastly, the “Chimera” shoes cost $125.00 and come in four colors: Black/Red, Yellow/White, White/Red, and Grey/Pink. Lil Wayne Highlighter Yellow & Turquoise SUPRA “Chimera” Sneakers Now Available To Buy! Two months after Lil Wayne released the first three colors of his “Chimera” sneakers from his SPRECTRE by SUPRA footwear brand, he releases a new color today. The new shoes, which are a highlighter yellow and turquoise color, can be purchased from SUPRA‘s official website here for $125.00! Lil Wayne’s first shoe from SPECTRE by SUPRA is a high top unlike any other. The upper features a unique, padded, clamshell heel panel; a collar panel that flows from the heel, around the toe box, and back again; internal lace ghillies; a large, padded tongue with stash pocket; and generous padding throughout the entire upper makes for a snug and comfortable fit. The shoe rests upon a basketball-inspired outsole with a distinctive, lightweight, SUPRAFOAM midsole. 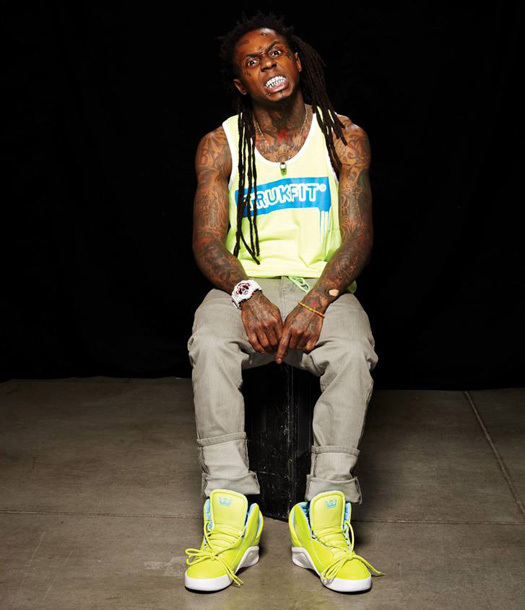 Lil Wayne’s “Chimera” Shoes From SPRECTRE By SUPRA Brand Now Available To Buy! Today is the day Lil Wayne‘s “Chimera” sneakers from his SPRECTRE by SUPRA footwear brand are available to the public for purchase! The shoes cost $125.00 and they come in three colors: grey, white, and black. If you want to buy a pair or more of the “Chimera” sneakers, then you can do so here from the official SUPRA website. There is no word yet on when the “Griffin” and “Kondor” designs will be available to buy. In related news, hit the jump to watch an interview Complex did with Weezy F Baby about his shoe line at his SPRECTRE by SUPRA launch event in Miami, Florida on May 3rd. SUPRA release a new video of Lil Wayne to promote his footwear brand with the shoe company, which is titled SPRECTRE by SUPRA. The clip includes footage of Weezy F Baby‘s previous interviews were he talked about his past relationship with SUPRA, a photo shoot with him wearing his SPECTRE sneakers, and his recent launch party in Miami on May 3rd. 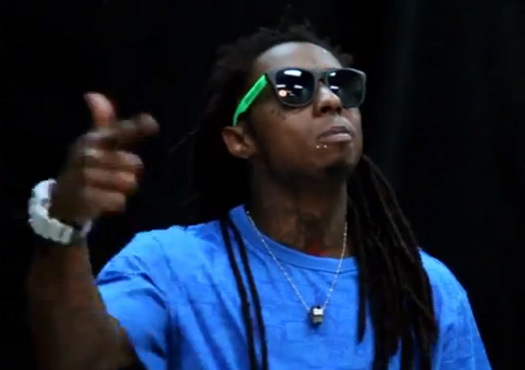 You can view photos and more information about Tunechi‘s shoe line here. There will be three different designs on SPRECTRE by SUPRA – Chimera, Griffin, and Kondor. The release date for them is May 18th! 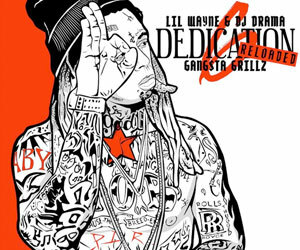 It’s been a good while since we have seen one of these type of interviews with Lil Wayne! While at the SPECTRE by SUPRA launch party in Miami last week, Mass Appeal asked Weezy F Baby plenty of questions for the latest episode of thier “Off Tha’ Wall” series. Tunechi answered why he decided to start rapping, what memories he had from the Hot Boys days, how he got the nickname “Shrimp Daddy”, what it is like being a rap star, why he decided to start skateboarding, what his favorite SPECTRE by SUPRA model is, how he came up with the name TRUKFIT, what his favorite sports movie is, what the most unexpected song on his iPod is, his guilty pleasures, what his pet peeves are, what he hid from his mother growing up, if there are any quotes that he lives by, what is next for him, and what his last meal would be. Mass Appeal also asked Wayne who he prefers out of Martin or the Fresh Prince, Michael Jackson or Prince, and Marvin Gaye or Stevie Wonder. This is then when Tune tells the story of Stevie once telling him to shut up at a party. Check out the cool interview in the video above!